Claudio Casadio graduated from the Accademia Antoniana di Arte Drammatica in Bologna in 1982. 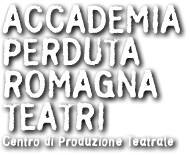 Founding member of the theatre company Accademia Perduta/Romagna Teatri - Centro di Produzione Teatrale, he is author, performer and director. An internationally recognised actor, Claudio has performed in the most significant Italian and European theatres as well as being invited to very prestigious showcases like the International Spoleto Festival, the Ravenna Festival, the Giffoni Festival, VolterraTeatro, Theaterherbst in Berlin (Germany), Momix Festival in Kingersheim (France), Teatralia (Spain). With the pièce Pollicino, Claudio has received awards at both the Momix Festival in France (2010) and the Biglietto d’Oro AGIS-ETI. Claudio has directed for the Spanish company Teatro Paraiso the shows Los musicos de Bremen (2007) and El flautist de Hamelin (2009). In 2009, Claudio made his cinema debut as the main character in the film L’uomo che verrà by Giorgio Diritti, awarded the Marc’Aurelio d’Oro prize at the Rome International Film Festival as well as the David di Donatello. Claudio continued his cinema work with a role in Romanzo di una strage, a film directed by Marco Tullio Giordana. During the 2012/2013 and the 2013/2014 theatre seasons, Claudio was main actor, together with Giulio Scarpati, in Oscura Immensità (Dark Immensity), a co-production by Teatro Stabile del Veneto and Accademia Perduta/Romagna Teatri, written by Massimo Carlotto and directed by Alessandro Gassman. During the theatre seasons of 2014/2015, 2015/2016 and 2017/2018, Claudio played leading actor together with Pamela Villoresi in Il mondo non mi devenulla (The world owes me nothing), a co-production by Accademia Perduta / Romagna Teatri and Teatro e Società, with texts by Massimo Carlotto and direction by Francesco Zecca. In 2015, Claudio joined the cast of Bella e Perduta (Beautiful and lost), a film by Pietro Marcello, presented at the Locarno Film Festival. Over the course of the 2015/2016, 2016/2017 and 2017/2018 theatre seasons, Claudio has performed as main actor with Giovanni Anzaldo and Fabio Bussotti in Mar de Plata, a co-production by Accademia Perduta and Società per Attori, texts by Claudio Fava and direction by Giuseppe Marini. The production has been awarded the 2016 Premio Speciale Persefone “Carmelo Rocca”, as “Best Contemporary Piece”.